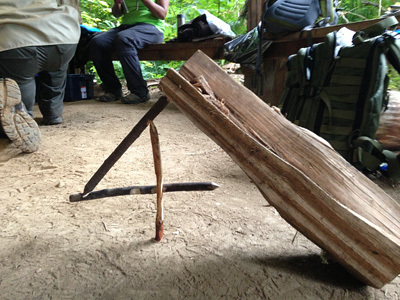 The weekend wilderness survival course teaches the essential survival skills any outdoors-person should have… just in case. Students of this intensive course built a survival shelter, created fire from friction, boiled water primitively, and set deadfall traps. Here Maryann is lying down on the very comfortable sword fern mattress in a debris hut. Maybe she will wake up with a slug on her face! David has created his first friction fire using the bow and drill method. 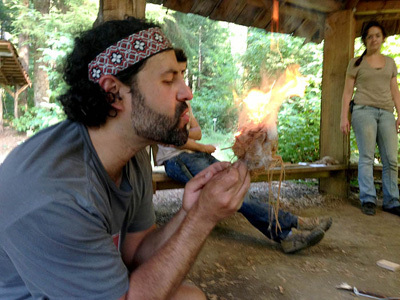 In this photo he is blowing a buffed cedar bark bundle into flame. That is how our ancestors did it. Great work Dave. Check out that boiling water! 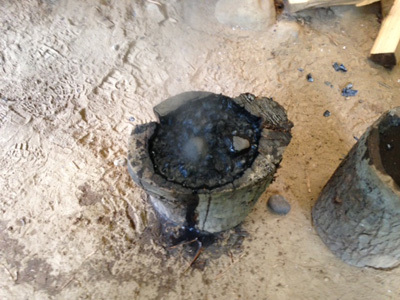 Hot stones in a wooden bowl were used to heat up this creek water. Take that giardia! 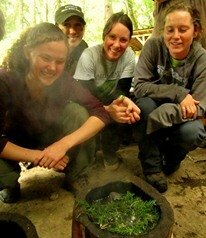 Students transferred the stones from the fire to the water with a bark shovel and vine maple tongs. 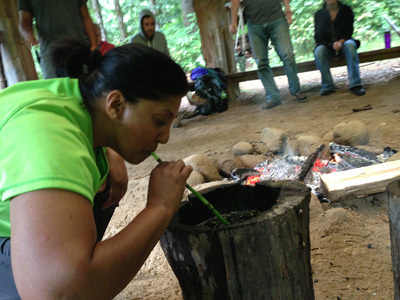 Wendy enjoys a sip of hot evergreen tea with her horsetail straw. There is nothing like a vitamin C rich warm beverage to boost morale in a survival situation. Dino, our one eyed dinosaur is hungry. He smelled the peanut butter on Norma’s trap! Watch out Dino. Congratulations to all of our August 2013 Weekend Wilderness Survival Course students. You survived the class. Keep working on that friction fire! 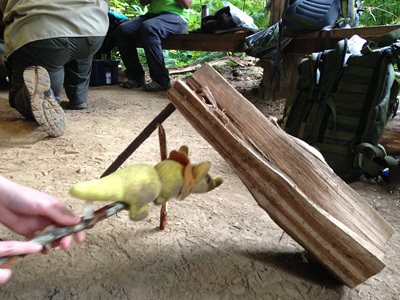 Would you like wilderness survival training? 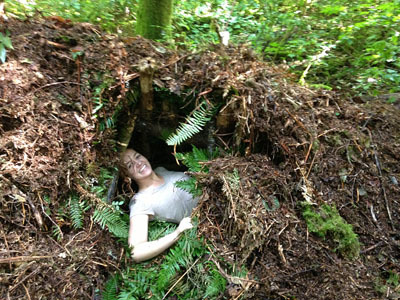 Check out more opportunities to learn wilderness survival on our Wilderness Survival Courses Page.